Here is a nice National Geographic video with some dramatic footage from Lake Tanganyika. Check out the aggression of a pair of Emperor Cichlids (Boulengerochromis microlepis) defending their young from a hungry turtle. Isn't this why we love cichlids? Amazing parental behavior! Ted Judy, a friend of the GCCA and an all-around awesome guy, created a nice video recap of ACA 2012. Ted was a vendor and the show and you might know that Ted also sells Repashy Foods from his website. Thanks, Ted, for the video! Terry Tankersley, or Tank, as he is often called, is a frequent vendor at GCCA Swap Meets. Terry lives near the Wisconsin border and is active in the Milwaukee Aquarium Society. Tank had posted an ad at the 2012 ACA Convention for 55-gallon polypropylene totes. That sounded like just what I needed for some growout space but we were not able to connect at the convention. To my good fortune, Terry agreed to meet a week later and I drove to his house to see the totes. 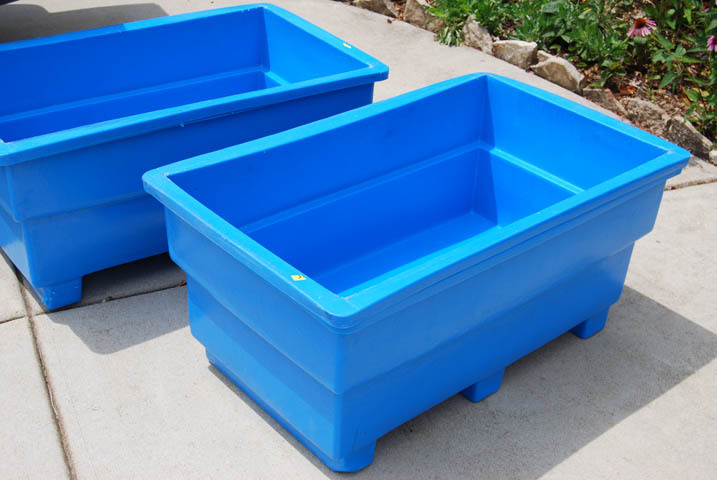 The totes are used, food-safe totes used in the pharmaceutical industry and they hold 55 gallons. They are heavy-duty plastic and double-walled. That appealed to me because I thought the double-wall would hold heat better. They are meant to be moved with a pallet jack, so they have feet which elevates them about 3 inches. Terry has about 100 totes and they are inexpensive at 3 for $100 or $35 each. I bought one but would have bought more if I could have fit them in my car. Unfortunately, I only had my Camry and I could fit just one in the back seat. I had contemplated taking my wife's minivan, but I would then have had to explain that I was buying more fish tanks. That, my friends, is fishkeepers Catch-22. Sharon doesn't know I bought the tote yet. Or another tank from Terry. Terry was nice enough to show me his fishroom. He keeps a variety of fish and inverts including livebearers, cichlids, bettas, shrimp and snails. It was a great visit to a super nice guy.